I can't help but laugh at the antics of Aya Endo at her blog. 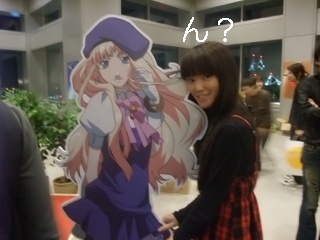 She is the voice of Sheryl Nome in Macross Frontier. Is it just me?, but compared to her Macross Frontier alter ego, I have a feeling that they are exact opposites. That's probably the reason why she won best supporting actress in this year's Seiyuu awards, because she was able to project a character much different from herself. Then again, I could be wrong. She sure likes to take a lot of photos of the stuff she eats.